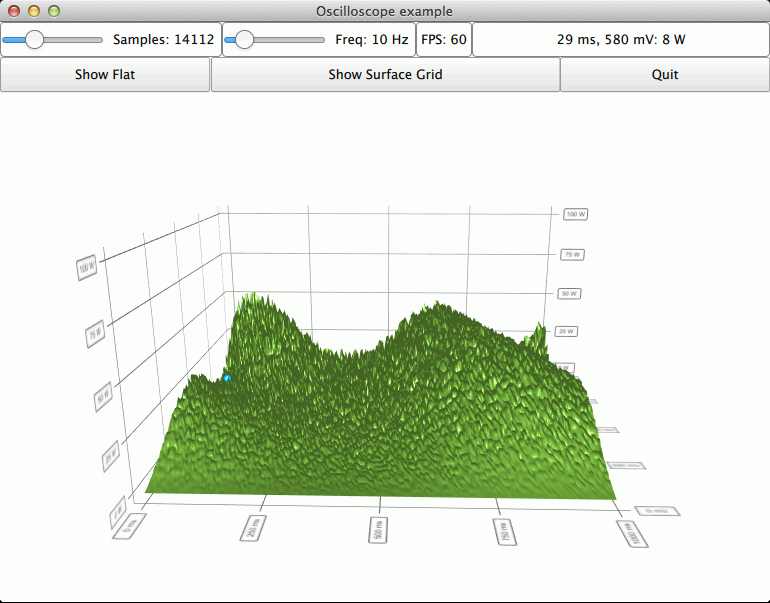 The Qt Quick 2 oscilloscope example shows how to combine C++ and QML in an application, as well as showing data that changes realtime. The interesting thing about this example is combining C++ and QML, so we'll concentrate on that and skip explaining the basic functionality - for more detailed QML example documentation, see Qt Quick 2 Scatter Example. The item model based proxies are good for simple and/or static graphs, but to achieve best performance when displaying data changing in realtime, the basic proxies should be used. Those are not supported in QML, as the data items they store are not QObjects and cannot therefore be directly manipulated from QML code. To overcome this limitation, we implement a simple DataSource class in C++ to populate the data proxy of the series. Note: Even though we are operating on the array pointer we have previously set to the proxy we still need to call QSurfaceDataProxy::resetArray() after changing the data in it to prompt the graph to render the data. One interesting detail is that we don't specify a proxy for the Surface3DSeries we attach to the graph. This makes the series to utilize the default QSurfaceDataProxy. We also hide the item label with itemLabelVisible, since we want to display the selected item information in a Text element instead of a floating label above the selection pointer. This is done because the selection pointer moves around a lot as the data changes, which makes the regular selection label difficult to read.